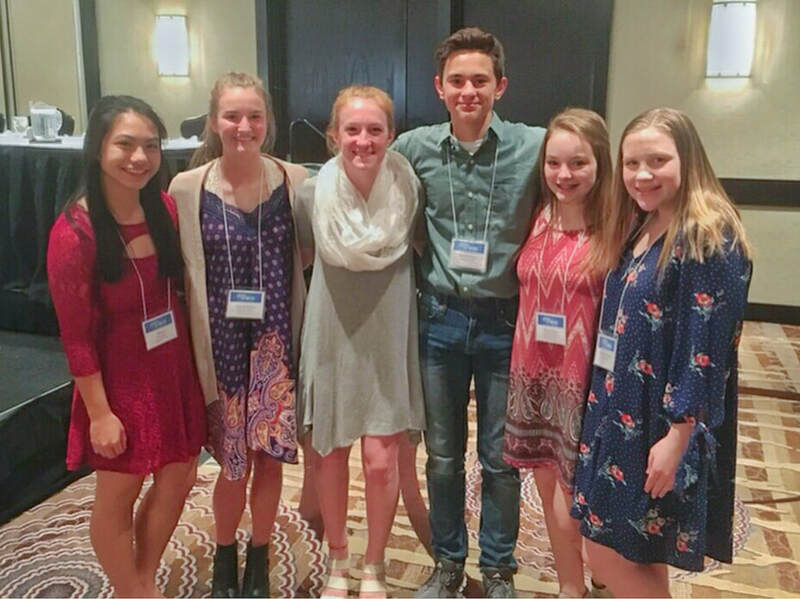 The 2018 Kansas District Key Club convention (DCon) took place April 6-8 at the Wichita Marriott. The event was filled with some of the brightest stars in the district. Clubs from across Kansas joined together for a weekend of workshops, speakers, service projects, and a celebration of their accomplishments throughout the year. ​The convention opened Friday night with guest speaker and Pittsburg mayor Jeremy Johnson, who spoke about citizenship, politics and the importance of standing up for what you believe in. Referencing Pittsburg’s “Our Lives Matter March,” he described how every high school student can be an active member of their community, whichever side of an issue they support. Saturday began with Keynote Speaker Emily Stevens, a former Kansas District Secretary, who described her journey from a timid, “stay at home” high school student to a role as one of the highest-rated radio personalities in Wichita to her current occupations as a therapist/counselor and a fashion entrepreneur. At the heart of her speech was the message “you are not now the person you will become." ​On Friday night, candidates for the 2018-19 District Board spoke about their goals and answered questions from attendees in two caucus rooms. Caucuses took place again on Saturday night. By then three more clubs had arrived, additional candidates had declared, and questions from the audience were more sophisticated. However, candidates still enjoyed some hilarious questions and requests such as "Show us your favorite dance move," "Relate Key Club to your favorite vine," and "Do an impression of the yodeling Walmart kid." Focusing on the best practices for club projects and fundraisers, Lt. Governor Jonathan Lozano and Joe Fisher led a sharing exercise that gave clubs ideas and practical tips for making projects more productive and fundraisers more profitable. Webmaster Austin Kruse and Lt. Governors Tejaswi Shrestha and Shayden Hanes led a discussion of social media and how it can be used to better mobilize your club. The strengths and benefits of current platforms were compared for achieving specific results. Set a completely new course for club building through member retention and recruitment. In this involving session, Lt. Governors Allison Carder and Jasmine Robles used interactive exercises to uncover ways of increasing member involvement by giving them instant identities! A unique exploration of leadership training, facilitated by Governor Chloe Lubbers, Secretary Lauren Textor, and a guest businessman who understands the importance of selecting a mentor. The workshop concentrated on professionalism in communicating with adults. Lt. Governors Kylie Jenkins and Nickolai Mellinger explained expectations for essential applications, such as writing emails and resumes and answering interview questions. Lt. Governors Allison Carder and Jasmine Robles facilitated a leadership workshop that featured a special guest. Participants learned how to build their skills by utilizing resources and setting goals with these expert techniques. This workshop provided methods of establishing good study habits and organizing your life. Lt. Governors Mia Tomason and Tejaswi Shrestha explored a variety of strategies and tips for developing personal behaviors that can make you more efficient and successful. A workshop for dealing with anxiety, depression, and other systems of isolation. District Secretary Lauren Textor and Webmaster Austin Kruse were joined by Keynote Speaker Emily Stevens to discuss ways to cope and reach out to others. Experience service around the world! International Trustees Rohan Mekala and Luke Gilmore, District Secretary Lauren Textor, and Lt. Governors Tejaswi and Jonathon gave a preview of the 2018 District Tour to Chicago and International Convention. Imagine a summer weekend retreat where you grow as a leader and meet new people! Lt. Governors Austin Kruse and Nickolai Mellinger presented first-hand accounts of Key Leader and its transformative activities. Juniors and seniors were able to ask for suggestions and advice from panelists who are currently in college. Lt. Governors Kylie Jenkins and Mia Tomason, members of the Kansas Circle K District Board, and past Key Club Governor Emily Stanley held a Q&A about Circle K and college life. An advisor and sponsors session, facilitated by Kansas Kiwanis Governor-Elect Rick Dickman. Experienced advisors offered advice, and topics introduced by newer advisors were discussed. ​The Friday evening mixer began after caucuses. Key Clubbers were paired first, then in shifting groups of four, three, two, four and five with different activities in each combination designed so students, advisors, sponsors and guests could learn about each other. Guests included International Trustees Rohan Mekala and Luke Gilmore, and Georgia District Key Club Governor Jose Ramirez (pictured left with District Governor Chloe Lubbers). Saturday night featured a dance in which attendees showed off their skills while wearing the convention shirt. Everyone enjoyed some popular hits as well as several beloved throwbacks. The Saturday banquet featured monumental achievements of Kansas Key Clubbers: the single service project awards and the announcement of Michael Kyriakos of Ottawa as 2018 Faculty Advisor of the Year. In addition, the impromptu essay contest winner read her inspiring take on the prompt. The district talent show also took place, with entries in piano playing, singing, and oration. Throughout the talent show, emcees District Webmaster Austin Kruse and Lt. Governor Tejaswi Shrestha added their own twist with hilarious skits in between acts.